On 1 May 2017, the United Nations Human Rights Council conducted Bahrain’s third-cycle Universal Periodic Review (UPR). In this most recent iteration of Bahrain’s review, dozens of states issued 217 recommendations to the Government of Bahrain, outlining numerous ways to improve the country’s human rights record. These recommendations covered a wide range of important thematic issue areas, representing a strong rebuke to the Bahraini government over its rapidly deteriorating human rights record. Moving forward, that same deterioration needs to serve as a stark reminder to the states that offered recommendations on 1 May that they must back up their words with actions in order to ensure accountability and demand progress from Bahraini authorities. States can start by keeping pressure on the Government of Bahrain over its judicial harassment of civil society actors, which has recently included subjecting more than 30 individuals to travel bands in order to prevent them from traveling to Geneva to participate in the UPR process. Bahrain’s last UPR took place in 2012, one year after the country’s peaceful pro-democracy protest movement of 2011. In addition to the more than 60 states that issued a total of 176 recommendations to Bahrain, 47 individuals representing Bahraini civil society were able to participate in the country’s second-cycle UPR in 2012. By contrast, only two members of civil society – Sheikh Maytham al-Salman of Bahrain Interfaith and Ebrahim Demestani of the Bahrain Nursing Society – were able to participate in 2017, both of whom had already been outside of Bahrain for several months. Due to their willingness to engage with the UPR process and with UN human rights bodies more broadly, both Al-Salman and Demestani may be at risk of harassment and abuse upon re-entering Bahrain. 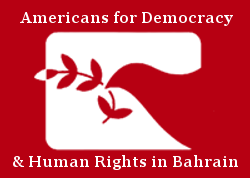 Bahraini civil society was severely underrepresented at Bahrain’s third-cycle UPR due to the Bahraini government’s apparent targeted campaign of judicial harassment directed at a broad range of civil society actors, including activists, human rights defenders, journalists, union members, political figures, and lawyers, in the run-up to the 1 May session in Geneva. The government summoned at least 30 such individuals for interrogation and subjected at least 32 to travel bans. The Bahraini public prosecution charged several, including Wa’ad political society leading members Ebrahim Sharif and Farida Ghulam, journalist Ahmed Radhi, and human rights defender Fatima al-Halwachi, with attending illegal gatherings in the village of Duraz at separate times in late 2016 and early 2017. Duraz has been the site of a long-standing peaceful sit-in since June 2016, when the government stripped Bahrain’s most prominent Shia religious leader, Sheikh Isa Qassim, of his citizenship and initiated legal proceedings against him. Each of them deny having visited the village. Bahrain’s efforts to bar civil society actors from traveling to participate in the UPR bring into sharp relief its willingness to effectively gag anyone who would criticize or challenge the government. Indeed, by preventing civil society actors from speaking at its UPR session, the Government of Bahrain sought to ensure that alternative versions of events and human rights conditions inside the country were not presented. Such steps are becoming common components of the Bahraini government’s repressive repertoire: in mid-2016, Bahraini authorities also began to systematically impose travel bans as a means of conducting reprisals against anyone seeking to engage with UN human rights mechanisms. Between June and September 2016, the Government of Bahrain subjected nearly 30 activists to travel bans, many of whom were attempting to attend the 32nd and 33rd sessions of the UN Human Rights Council (HRC). During the 34th session of the HRC, Bahraini authorities targeted the family members of Bahraini activists, including Sayed Ahmed Alwadaei and Ebtesam al-Saegh, who engaged with the HRC and other UN human rights mechanisms during the Council session. While it has routinely conducted reprisals against civil society actors who engage with UN human rights mechanisms, the Government of Bahrain itself continues to fail to engage with these bodies itself. Indeed, Bahraini authorities have not allowed a UN Special Procedures mandate holder to conduct an official visit to the country for more than a decade, despite making pledges to the contrary. When it comes to the UPR process, Bahrain’s record is similarly unimpressive. Of the more than 176 recommendations it received during its second-cycle UPR in 2012, Bahrain fully or partially accepted only 158 and has since failed to make any perceptible progress on 133 of those. As a result, many of the recommendations that resulted from Bahrain’s recently-completed third-cycle UPR relate to these unimplemented aspects of the 2012 review. Ultimately, the Government of Bahrain has failed to indicate any willingness to engage in meaningful human rights reform over the past several years. In the aftermath of the scores of worthy and important recommendations issued during Bahrain’s third-cycle UPR, the international community must not let its admonitions go ignored once again. In the short term, states can work towards ensuring that the Government of Bahrain begins to heed the advice contained in their recommendations by urging Bahraini authorities to lift all travel bans and cease all forms of interference with the country’s independent civil society actors. Similarly, states should demand that the Government of Bahrain allow Sheikh Maytham al-Salman and Ebrahim Demestani to re-enter the country without harassment or abuse following their participation in the third-cycle UPR process. The international community took a crucial step towards holding the Bahraini government to account for its human rights abuses on 1 May, and it must not let this opportunity to demand meaningful reform in Bahrain slip through its grasp.